Before I blow your mind as promised, quickly answer this easy question. If you had to choose one of the two portfolios below to invest in for the long-run, judging from the returns of each portfolio, which portfolio would you choose? Easy right? Portfolio 2 had a higher average annual return, you would obviously be better off if you invested in that portfolio. To make sure this answer is correct, let’s look at a chart of how much wealth would have been accumulated if we invested $100 dollars in each of the two portfolios between January of 1929 through December of 2017. Portfolio 1 with the lower average annual return, grew a $100 investment into $613,448 and Portfolio 2 with the higher average annual return, grew a $100 investment into $25,655. The chart shows that Portfolio 1, with the lower average annual return would have been the correct investment choice because it accumulated almost 24 times more wealth, despite having a lower average annual return than Portfolio 2! Mind blown, right? I would venture to guess most of us chose Portfolio 2 with the higher average annual return and we would be a lot poorer as a result. You might be thinking I have made a mistake or have calculated the returns incorrectly, let me assure you these results are accurate. I am sure the burning question you have is how this outcome was possible. The answer is simple, but also one of the most mis-understood, concepts in the investing world. Considering most investors, even professional investors, weigh much of their investment decisions on past returns, it is important you read on as I explain this significant, even game changing result. I believe what you will learn could dramatically improve your investing outcomes, not to mention your quality of sleep at night. Before I explain how the results of the previous example are possible, it is important to explain the investments the two portfolios held throughout the time period we examined. 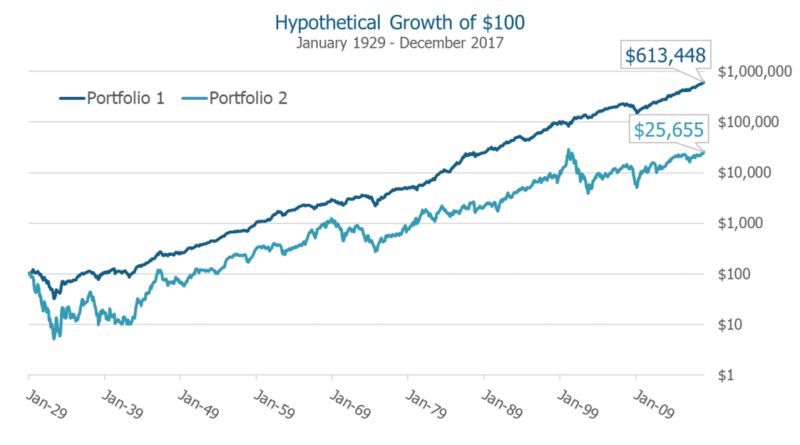 Both portfolios were invested 100% in U.S. stocks for the entire time period, the only difference between the two portfolios was the risk of the stocks each portfolio held. Portfolio 1 was invested in all the lowest risk stocks as measured by the volatility of their prices and Portfolio 2 was invested in all the highest risk stocks. The holdings of each portfolio are extremely significant. The fact that the winning portfolio held only the lowest risk stocks is incredibly important because it seems to contradict the commonly excepted investing wisdom that says, you must be willing to take more risk in order to earn higher potential returns. Here I go blowing your mind again. This common investing wisdom that almost all investors believe and most of the investment management industry uses as a foundation for building portfolios, appears provably false, or at least misleading. I have just introduced you to the greatest investing secret hidden in plain sight, low-risk stocks have historically produced higher long-term returns in the form of higher ending portfolio values. What I have demonstrated in the two-portfolio example is called the low-risk investing paradox. Webster dictionary defines a paradox as a statement that is seemingly contradictory or opposed to common sense yet perhaps true. The fact that low-risk stocks produced much greater wealth than high-risk stocks, appears to fit the definition of a paradox perfectly, especially if you, like most, believe the common investing wisdom. Why low-risk stocks outperform high-risk stocks over time? Wow, we have seen some incredible findings so far. However, just as important as the low-risk investing paradox finding is, understanding why it exists in the first place is just as important. The reason low-risk stocks are capable of outperforming high-risk stocks over time is simple…it comes down to investment math. It is great news that investment math explains the low-risk investing paradox and not data mining or chance, because when I explain the math to you and the reason for the results in the two-portfolio example, you should find the answer intuitive and even perhaps obvious in hindsight. Few investing concepts are this clear and yet mis-understood, so let me create a moment of clarity for you as we look at the math behind this amazing investing paradox. The returns for the two portfolios were calculated using the industry standard method of presenting performance to investors called the simple rate of return. The simple rate of return calculation has one major problem when using it to compare investments, it ignores compounding. Ignoring compounding is a big deal because when investors buy a stock, they will earn the compounded return and not the simple return. Given this information, it seems logical that we would want to compare these two portfolios in a way that would reflect the returns we would actually realize if we invested in the portfolios. Let’s calculate the compounded return on the two portfolios from the original example. And there you have it, had you invested in the low-risk Portfolio 1, you earned an average annual compounded return of 10.3% versus 6.4% in the high-risk Portfolio 2. Using relatively simple math calculations we have uncovered that the low-risk investing paradox is not really a secret at all, it is simply a mis-understanding of how investment returns work. What simple returns do not account for that compounded returns do, is risk. A simple return is a basic calculation that reports the performance of a security or portfolio between two dates. A compounded return reflects the impact that simple returns have on the value of your investment account. These are very different performance calculations, and only compounded returns should matter to you because they are a true reflection of the impact of your investment decisions on your wealth. To better understand the difference between the two return calculations, let’s say you have a portfolio of stocks that is worth $10,000 at the market open. A terrible market crash occurs over the day and your portfolio loses -50% by market close. After the day’s losses, your portfolio is now worth only $5,000. The next day, by an incredible stroke of luck your portfolio returns a positive 50%. You may intuitively believe you have earned all your money back from the previous day’s losses. Your portfolio went down -50% one day and up 50% the next, the portfolio is now even, right? No, your portfolio value at the end of the second day is just $7,500 and not the starting value of $10,000 because of the way compounding works. If you reviewed your portfolio performance for the two days in the proceeding example using the simple returns method, your portfolio return would have been 0% (-50% + 50% = 0%). However, if you calculated your compounded return for the two-day period you would be disappointed to find out your portfolio return was actually -25%! The reason for the difference between the simple and compounded returns in this example is that on the first day your portfolio started with a value of $10,000, then lost -50% making it worth only $5,000 at the end of the day. The second day when the stocks returned a positive 50% your portfolio gained 50% on the much lower second day starting value of $5,000. A 50% return on $5,000 dollars is $2,500 making your portfolio value at the end of the second day just $7,500, not the starting value of $10,000. For the portfolio to get back to even after losing 50% the first day, it would have had to generate returns of 100% the second day. The compounded return and not simple return is what you actually gain or lose on an investment and is a true reflection of the impact the return your portfolio generates has on your wealth. Unfortunately, I have some additional bad news about the nuances of compounding on the performance of your portfolio. Both positive and negative returns compound and compounding losses are detrimental to your wealth. The larger the loss, the greater the returns must be to fully recover and get back to even, thanks to compounding. The relationship between the size of the loss and the return needed to recover is exponential! The table below shows this relationship. As you can see in the table, if a portfolio sustains a loss of 40%, returns of 67% are required to recover from the loss, not 40%. Because the relationship between losses and the gains required to recover are not proportional but exponential, the larger the loss the uglier the recovery becomes. 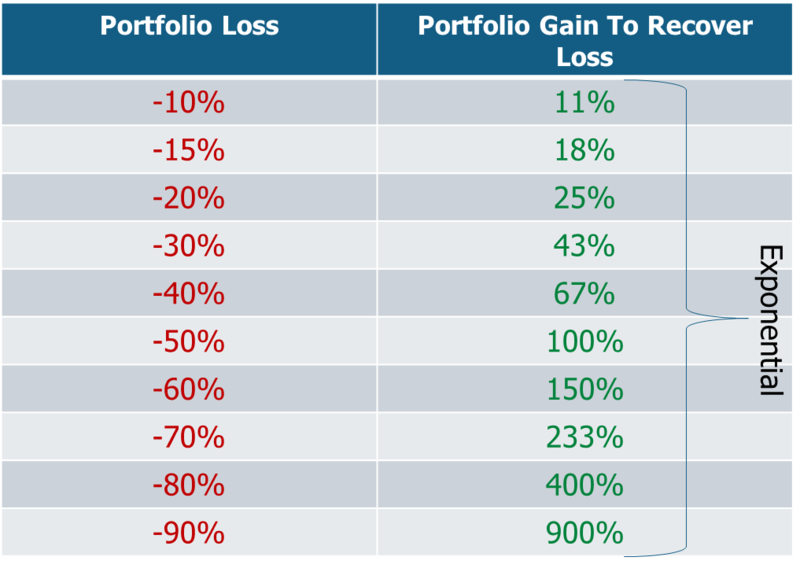 If the portfolio loss doubles to 80%, returns of 400% are required to recover from the loss! What should be starting to become clear is why the high-risk portfolio in our two-portfolio example, generated so much less wealth than the low-risk portfolio…because of risk. Simple returns ignore compounding and therefore do not account for the risk taken to earn the returns generated. While the returns we used in the compounding example were extreme, the effect losses have on a real-world portfolio are the same. 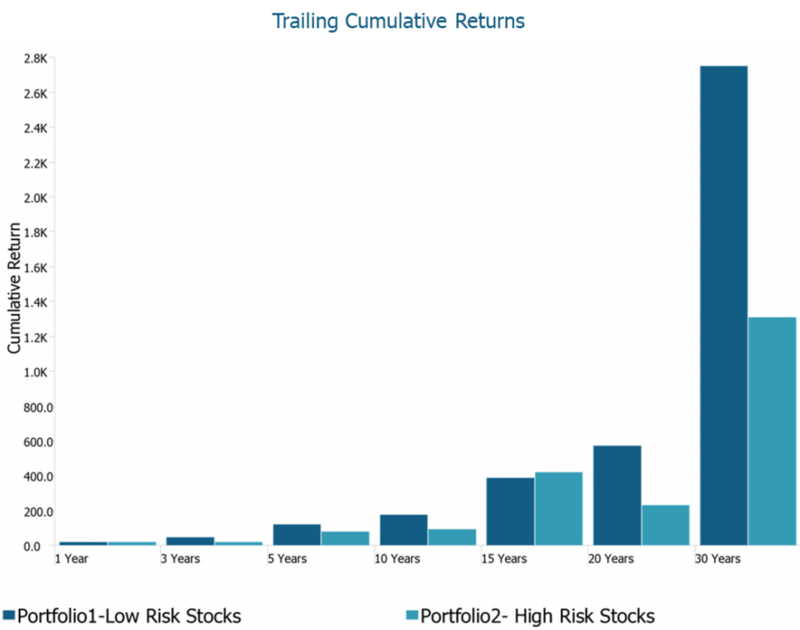 Riskier portfolios generate larger losses that accumulate. Because of the exponential relationship between the size of losses and the returns that are required to recover from them, high risk portfolios must “spend” more of their positive returns digging out of the deeper performance holes they create for themselves during declining markets. Alternatively, low-risk portfolios generate consistently smaller losses and therefore benefit more from the positive side of compounding by compounding returns on higher average portfolio values. Also, because low-risk portfolios are likely to accumulating smaller losses, they need to generate exponentially lower returns to recover from the smaller losses. The bottom line is risk decreases the efficiency of wealth accumulation. We should all think of compounding like mother nature, we are best served by having a healthy respect for her power. You may have noticed that the two-portfolio example showed the results of investing $100 in each portfolio over a very long period of time that started in 1929. A logical question to ask is, does the low-risk investing paradox exist over shorter time horizons? Not all of us have 88 years left to invest in the markets. To explore this question, we can look back at compounded returns on our two hypothetical portfolios in shorter intervals over the most recent 30 years. The chart below shows compounded returns for the most recent 30 years, broken down into shorter time periods. There are two primary observations we can make from this chart. First, timing of when you enter the market matters, but overwhelmingly, your odds of outperforming are significant by investing in low-risk instead of high-risk stocks, even during shorter time horizons. The low-risk portfolio outperformed the high-risk portfolio over the most recent 3, 5, 10, 20, and 30 year time periods. Only the 15-year period shows that the high-risk approach would have won out, and by very little. The reason the high-risk portfolio outperformed slightly over the last 15-years can be attributed to timing. The portfolio entered the market following two years of back-to-back losses of -33% and -50% respectively, right at the bottom of a major dip. The first year the portfolio was invested, the market rocketed up 65%. The high-risk portfolio captured that large upside move at the beginning of the period without any capturing any of the massive previous two-year losses. We can conclude that timing of entry does make a difference, however, regular contributions to an investment portfolio can smooth out the impact of timing and possibly would have eliminated the difference between the two portfolios’ returns all together. Also, luck goes in both directions, so had you invested your money in both portfolios two years prior the low-risk portfolio would have been the winner, and by a larger margin. Over shorter time periods, it is likely that both high-risk and low-risk portfolios will take turns being ahead of one another. However, the low-risk portfolio will maintain more steady portfolio balances along the way and if a major recession hits, may pull ahead for the rest of your life expectancy. Low-risk portfolios have historically outperformed high-risk portfolios during recessions and lagged high-risk portfolios by a smaller margin during bull markets. The second observation from the chart above is that low-risk portfolios do benefit from time. The high-risk portfolio lagged further behind as the time periods got longer. The longer an investor holds low-risk stocks the greater the magnitude the outperformance is likely to be. Low-risk portfolios are the consistent turtle in the race and high-risk portfolios are the hare that moves quickly then stops to take a rest and sometimes just returns to the starting line before starting the race again. For the examples in this discussion I have used portfolios that invest 100% in stocks to explain the low-risk investing paradox. Most people do not invest 100% in stock but in diversified portfolios that include many different types of assets like stocks, bonds, real estate and others. Stocks are usually among the riskiest assets and the largest percentage of holdings in most diversified portfolios. More than 90% of the total risk of an industry standard 60/40 portfolio comes from stock exposure. Therefore, because of the outsized impact in terms of risk and return that stocks have on diversified portfolios, I chose to use stock portfolios in the two-portfolio example. Extensive research into most of the other asset classes in the U.S. and internationally also reveal the presence of the low-risk investing paradox. This finding is not surprising because the low-risk investing paradox can be explained as a function of mathematics, not a unique market anomaly. Therefore, the same principals of reducing the size of losses that works in stock portfolios are also highly effective in lowering the risk and raising the potential return of diversified portfolios. Historically, it has been possible to design diversified portfolios using low-risk concepts that have as little as half to two-thirds the risk of industry-standard 60/40 portfolios, without sacrificing long-term compounded returns. A well-designed low-risk, diversified portfolio has many benefits beyond reducing the risk of investing to a point you never have to lose sleep at night. For example, low risk diversified portfolios have a high probability of outperforming conventional 60/40 portfolios over time, and second, a single well-structured low-risk diversified portfolio is appropriate for an investor of any age, regardless of income, or stage in life. That sounds pretty good, right? I have presented in this discussion two investment approaches, the first is investing with the common investing wisdom and maximizing the risk you are willing to take to increase your potential returns, and the low-risk investing approach of minimizing risk to more consistently accumulate wealth. To be successful using either approach requires patience and a willingness to stay the course over a decade or more. The only mistake worse than not deciding on an investing approach, is changing your mind and switching your approach many times over your investing time horizon. It is my belief that a risk minimizing, as opposed to a risk maximizing approach to investing, has the highest probability of maximizing wealth accumulation over time. Low-risk portfolios are attractive because they minimize portfolio risk, which is within an investor’s control, but also minimize the potential impact of risks outside an investor’s control. Investors do not control if they will get sick and be forced to retire early, have unexpected future financial hardships, or the timing of recessions. The low-risk style limits losses and generates more consistent returns over time, leading to more consistent portfolio values. When the value of your portfolio is steadier over time, you leave less to chance and are impacted less by events outside of your control. Making the best possible investment decisions starts by avoiding the common mistakes most investors make. Here are the three common mistakes that the research we have discussed has uncovered. First, investors usually pick investments based on their past simple returns without much consideration of the effects of compounding, resulting in excessive risk taking and inefficient wealth accumulation. Second, investors ignore or do not have a solid understanding of how the math of investment returns work. Ignoring the powers of compounding losses is potentially hazardous to your wealth. Finally, most investors believe and invest following the common investing wisdom that says you must take more risk to have the opportunity to earn higher returns. We have demonstrated that the common investing wisdom may not stand up to the mathematics behind efficient wealth accumulation. The low-risk investing paradox shows us that investing is complex and an advantage can be gained by understanding the mechanics of wealth accumulation. We do not benefit from maximizing our portfolio’s simple return, we benefit from maximizing our wealth. As you make important investing decisions, remember this quote by writer Mark Manson.